This Giveaway is Sew Lovely! By stayhomecupcake on May 30th, 2011 . Filed under: Cupcake Ideas, Giveaways . Happy Memorial Day giveaway fans! This week our giveaway is sponsored by Etsy sewer, Lafashionista. Her shop is namedMmmily (love that!) and she specializes in beautifully made pouches and wristlets. It was very hard to choose, but these two creations are definitely two of my favorites. I own one of her zipper pouches and here it is! Cupcakes of course! It is so well made and the perfect size to hold coins, business cards, or any little things that tend to get lost in your purse. 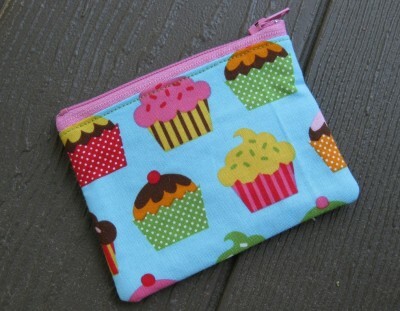 This week Lafashionista is giving away another cupcake pouch to one luck ATC fan! To enter this giveaway, click on the comment area below and tell us what was your favorite fabric AND what fabric you would like to see in her Mmmily shop. One winner will be chosen on Monday, June 6th. 45 Responses to This Giveaway is Sew Lovely! I love the cupcake pattern best of all! My favorite is definitely the Cute Quilted Zipper Pouch! Its so whimsical and cool. Plus it has cute birds on it, love birds! The fabric I would like to see is a cupcake tree pattern; it could have beautiful cupcakes with rainbow frosting hanging from the tree. As an avid tree planter, I always wished there was such a thing as a cupcake tree, haha. I’m not much of a baker, so being able to grow cupcakes would be too good to be true!! I love trees and cupcakes, so I would definitely buy that product!! Great shop, very cool wrist lets! So cute! Besides that cupcake one, I really like the mushroom village pouch, it has a fun and funky charm to it! Since I’m a bit of a foodie, I would love to see more food fabrics. Specifically, I’m thinking chocolate chip cookies and milk! I love the pink bubble fabric. I would love to see ACU patterned fabric. I know many army wives, like me, would love that! Beside the cipcake print of course, my favorite is the lemmon print. So fresh and summery. I like all of the fabrics but would love to see more sweets – candies, cookies and other yummy goodies. The cupcake one is so cute and I like the measuring tape one a lot as well. I would love to see a film strip one, I think that would be neat! I LOVE the cupcake one the best! Do you already do one for soccer? Also, ask your local middle school or high school, my daughter takes something similar to hold her I’d card, lunch $ and phone – great way to get in on the back to school sales! Wickedly cute pouches! Good luck to you! Of course I really like the cupcake pattern but if I was going to pick another pattern I think the vintage turquoise flower pattern is really pretty. I like the purses with the little strap in them. Very practical. Her items are really nice. I adored the Tree & Birds patterns. Of course, I would be excited to see more cupcake patterns, or something with owls! I love the Girl in the Mirror pattern. I would love to see patterns that feature famous landmarks from other countries such as The Leaning Tower of Pisa from Italy, Eiffel Tower from France, the Pyramids from Egypt and so on. Since I can’t travel, it would feel like I have a little piece of that country with me always. I love the cupcake pattern. I would like to see a western pattern, like a cowboy or cowgirl print. I love the cupcake pattern the best!!! So VERY cute!! I like the cupcake fabric the best ,I would love to see somethings with breast cancer ribbon fabric. Well, I liked the “country chicken change purse” best. In fact, I bought it! What would I like to see more of on this site…? More of the same whimsical stuff she’s already making! And June 6 in my birthday – would LOVE to be the winner! I really love the cupcake pattern best. I would love to see some junkfood patterns. Hamburgers, hotdogs and french fries ect!!! I like the print on the Cactus pouch…but I always want more cupcakes! I liked the pink cityscape second to the cupcake! It would be cute to have one with ice cream cones, and also a tea party fabric. I think they are all so adorable! But I would have to say I like the cupcake fabric the most! I’m a sucker for cupcake designs though. But I have a hard time finding cupcake fabric I like. This is a great design. It’s bold and bright and super fun! I just adore it! Besides the cupcakes I love the cute quilted zipper one. Ice cream cones or cherries would be super cute! Oh! and of course I would want a Doctor Who fabric of some sort made into a glasses case. I think the padded vintage floral pouch is cute! 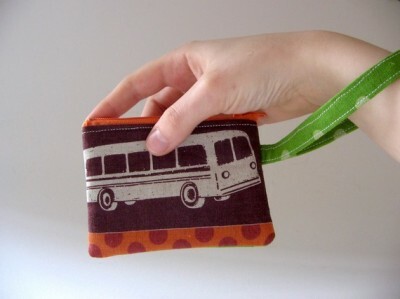 I would love to see a larger wristlet in a multi colored polka dot print. i really like the green tiger striped zipper pouch AND the lined paper zipper pouch omg, that was uber creative. sn, your hand crafted patterns are classic beauties. i think some african prints would be amazing, i also liked the pouches that had a contrasting but complimentary pattern on the inside. keep up the functional art! I love the polka dots and the quilted patterns, it would be great to see more of those in blues and greens! The cupcake pattern is my favorite, of course!!! I love coin pouches and wrislets. Great fabrics and sizes! 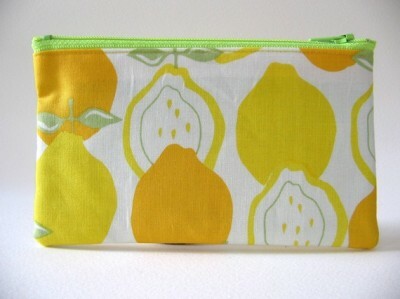 I definitely love the Lemon fabric and also the Lined Paper zipper pouch. I would love to see one created with a picture of a chocolate bar that says, bittersweet, on the bar. Cheers. Polka – polka – polka dots! I really like the pink polka-dot purse. I love anything pink, and this looks like a good size for coins. I would like to see small purses made of kitty fabric. Thanks! How cute. I love the fabric! I would love to win one!!! They are all so cute, hard to choose. I absolutely love the cute cupcake one and the Pink Polka Dot Zipper Pouch. I would like to see any variation and colored polka dot pouches, those are always cute! I really like her use of retro inspired fabrics, especially the retro zipper pouch with a touch of polka dots. I think that all of her fabric choices are great and would love to see one done with a peacock feather pattern which would be very chic and have a 1920’s vintage feel, adding polka dots or tea pots to the interior would add a touch of whimsy that would surprise many customers in a great way! Keep making your adorable products! i love the cupcake ones of course i would love 2 to see little piggy bank fabrics on the purses!!! those would be sooooo cute!!! or maybe wedding cakes!!! The cupcake ones of course!! I would love to see more cupcake ones, I’ve been looking for more like that!! My favorite has to be the Lined Paper Zipper Pouch, especially beacuse of the texture that makes the paper look nice and wrinkled. I would love to see more fabric with animals on them. I will definitely keep this place in mind if I ever need to find a present for a messy person :). You’re hand printed grid change purse is my favorite because I love that no two are the same! I always think it’s fun to have something that is one-of-a-kind! I would love to see a nautical fabric used with anchors and stripes! It would be great for Summer time! I absolutely love the cupcake pattern and I can always go for some children’s patterns! the vintage florals are beautiful, but the mushroom pattern is really bright and fun. It would be nice to see some autumn patterns…colorful leaves with vines and maybe a little squirrel collecting his winter stash.